United Nations human rights experts have expressed serious concerns about racism rooted in the fabric of the United Kingdom’s society, given the disproportionate number of people of African descent and of ethnic minorities dying due to excessive use of force by State security. “The deaths reinforce the experiences of structural racism, over-policing and criminalisation of people of African descent and other minorities in the UK,” they said. The UK Government last month responded to the concerns of the experts, recognising that further improvements were needed to develop solutions on healthcare in police custody, inquests and legal aid and support to families. Data disclosed by the Metropolitan Police in August 2017 found that people of African descent and those belonging to ethnic minority groups, in particular young African and Caribbean men were twice as likely to die after the use of force by police officers and the subsequent lack or insufficiency of access to appropriate healthcare. According to the experts, these deaths occurred in many circumstances, following the use of force involving firearms, tear gas agents, long handed batons, electroshock weapons; physical restraint resulting in the inhibition of the respiratory system and asphyxia; restraint equipment; and denial of appropriate healthcare. “Failure to properly investigate and prosecute such deaths results in a lack of accountability for those individuals and State agencies responsible, as well as in the denial of adequate remedies and reparation for the families of the victims,” they said. The Government said it had commissioned the Ministerial Council on Deaths in Custody to implement the recommendations set out in the Report of the Independent Review of Deaths and Serious Incidents in Police Custody, the experts said. The UN experts include E. Tendayi Achiume, Special Rapporteur on racism, who will visit the UK from 30 April to 11 May at the invitation of the Government; Michal Balcerzak, Chairperson of the Working Group of Experts on People of African Descent; and Fernand de Varennes, Special Rapporteur on minority issues. 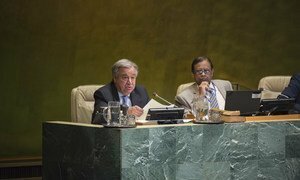 Commemorating the International Day of Remembrance of the Victims of Slavery and the Transatlantic Slave Trade, the United Nations Secretary-General on Monday said that while the abhorrent practice was abolished in the 1800s, it continues to have profound social, cultural and political impacts today.